Whiting Coq De Leon Hen Saddles were developed from stock that Dr. Tom Whiting imported from Spain in the mid 1990's. The Coq De Leon strains are actually the oldest strain of chickens bred for fly tying going back to a written manuscript of 1624. The stiff mottled hackles of the Roosters were carefully massaged from the chicken for extraction. This was done by villagers within the Leon District of Spain without any damage to the chicken and the feathers were sold throughout the world. Dr. Whiting has been able to develop this strain and capture the entire cape and neck of both the roosters and hens. This has provided a source that has never been available prior to 2000. 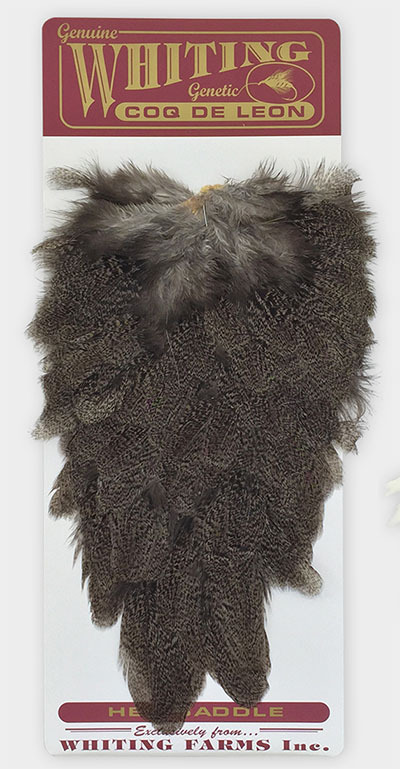 The Whiting Coq Hen Saddles have a distinct mottled coloration that is perfect for nymph legs, tails, and streamer collars. They are about 2-3 times longer the India Hen Saddles and have a thinner quill stem to allow much easier wrapping. Dr. Whiting has also introduced dyed colors that were never available in the past. See Color Chart.